You not only need to find new customers, but you need to increase sales to your current customers … you need them to come back regularly, to bring their loved ones to hang out too, to recommend you to their friends, and to spread the word that you make the Best _______ in Town! 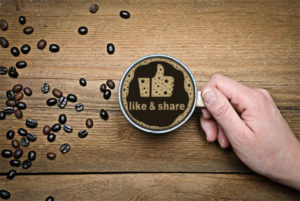 Here are 20 Ideas for Coffee Shop Marketing that will deepen your relationship with your current customers and help you entice the new ones to keep coming back for more. Utilize the power, reach and low cost of social media … especially Facebook & Twitter. 1. Today’s Specials: Let your customers know that they can easily find out the daily specials on your facebook page or via twitter … no need to call you and ask. If you have a live facebook and/or twitter stream on your website, then the special will automatically show up there too. 2. Menu Changes: An easy way to let your customers know that you’ve changed things up and keep them in the loop. 3. Barista’s Tips: Become a resource for your customers and help them out in their own coffee adventures with tips on home brewing, coffee freshness, coffee storage, complimentary food combos … whatever your baristas can dream up that might be useful information. Have a Weekly Drink Recipe for home brewed coffee that you promote via your blog and social media. 4. Social Only Discounts: Reward your customers for interacting with you via social media and offer them exclusive discounts with the proper code that was posted/tweeted. Make sure you put something like: Today Only, This Week, 48 Hours, etc. 5. Online to Offline Social Gatherings: Invite groups from Facebook and Twitter to have real world socials at your coffee shop … be sure to get all their facebook names and twitter handles so you can thank them for hanging out at your place afterwards. Be sure you give them one of your social-only discounts too. Make sure you’re using email marketing to it’s full advantage. The number 1 focus of your email needs to be the subject line and it should be short, to the point and enticing. 6. Newsletters: One of the great things about a weekly or monthly email newsletter is that you can present all the same items from #1 above, but link them back to your website/blog … especially the menu changes and barista’s tips. 7. Holiday Happenings: Give your customers a heads up on your upcoming holiday specials and events. 8. Email Contests: Contests that can only be entered via an email invitation so you can reward those who actually open and read your emails … they’ll keep opening them in hopes to find another one. 9. Customer Surveys: Feedback from your customers can often help you avoid disasters down the road. You can also use surveys as a crafty way to introduce new menu items to your customers … on your last visit, did you try our new Pumpkin Spice Latte? If not, did you not see it on the menu or be told about it from your barista? Think outside the box for unusual places to further market to your customers. 10. Restrooms: Put up a few ads of your featured offerings so your customers have something to distract them while they are indisposed. Have a special event coming up? Put up a poster on the back of the restroom door. 11. Customer Receipt: Print, or even hand write a special discount on the receipt redeemable on the customer’s next visit. 12. To Go Cups & Sleeves: If you use generic, non-branded cups/sleeves, write down a great trivia question or quote of the day … or just a great big happy face. You could pre-print things onto address labels and stick them on the java jackets. Reward the loyalty of your customers. 13. Loyalty Programs: Reward your customers for repeat visits. This can be as simple as a buy 10 get 1 free card or as complex as a points system built into your POS registers. Encourage customers to bring in their friends & family with buy one, get one or drink + half off deals. 14. Bouncebacks: A promotional offer given to a customer after a recent sale to encourage them to revisit soon, or “bounce back” to the coffee shop. Bouncebacks can be a straight discount, time-specific, product-specific, free item with purchase or BOGO (buy one, get one). You can give a greater discount for the customer returning during off-peak hours (20% off after 6pm or 10% off before 6pm) … only use generic discounts with first time customers, not repeat customers, since you don’t want to create a perception of lower value offerings. 15. VIP Party: Through a party with free drinks (and food?) for a selection of your most loyal and long-standing customers … even better, let them bring a plus 1. You’ll be amazed at how much buzz this can create for your restaurant. Host an Event. Cosponsoring an event allows you to leverage the reputation and credibility of the other participants. 16. Charity Fundraiser: Chose 1 day to promote that 10% of All Sales will be donated to a local charity … send out a press release to the local papers/news stations about the event. 17. Contests: Everyone loves a contest … be it competitions, games, giveaways, raffles … whatever you can dream up. 18. Live Music: Have one night of the week or month that you invite local musicians in to perform. 19. Art Show: Have a monthly event where you turn your coffee shop into a miniature art gallery of local artists. 20. Holiday Parties: Let customers know that they can rent out your space for their holiday parties. A final note for you to remember: when marketing your coffee shop, it’s important to make sure a consistent “personality” is presented to your target audience. An upscale coffee shop/cafe needs to be marketed much differently than a low-key espresso bar … and this needs to be reflected in your communications.